The Tampa Bay Newcomers Charity Committee, chaired by Sandy Smith, selected Pasco Kids First as their annual charitable donation recipient. Pasco Kids First representatives Becky Bennett and Jon Wisenbaker were joined by Healthy Families Pasco-Hernando Graduate Michelle Barber at the group’s monthly membership luncheon. Barber shared her story of being a first time mother of twins and the impact the organization made on her family. 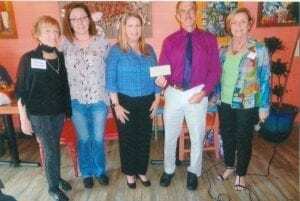 Tampa Bay Newcomers President Marleen Eagan presented Pasco Kids First with a check for $2,500. Tampa Bay Newcomers was founded in 1950 to extend the hand of friendship for women who want to make new friends. The club is both a social and community service organization. Monthly luncheons are held throughout the Tampa Bay area and feature local speakers.